ShortScale :: View topic - What can I get for my Fender Super-Sonic? What can I get for my Fender Super-Sonic? Posted: Wed Aug 17, 2016 12:45 am Post subject: What can I get for my Fender Super-Sonic? Hi, I have had a Fender Super-Sonic for around a year or so. It is in pristine condition as I have taken great care of it and haven't played live with it. There are no dings whatsoever and the only damage is probably just the minor scratches on the pickguard that every guitar that has some sort of playtime will gain. I will attach some quick pictures I took of it. I had it set up at a local shop for .10's and other than that I haven't done any sort of mods to it. I was interested in possibly parting with it and was curious to what some of you believe I could get for it. Many of you seem very knowledgeable and I figured I would get a rough guess from this board instead of Guitar Center which will likely offer me crap. I'm not trying to sell it here I am just asking for what some members think it's value is. I'd look at completed listings on Ebay and then go from there. I don't see many of the gun metal variety on various marketplaces so I figured I'd at least ask the community here seeing as many of you are the type of people who would be interested in such an axe. I think Guitar Center will likely offer you 50% of whatever they sell it for. They use eBay as a price guide for the most part, probably reverb.com now too. Reverb is a game changer, I've had good luck buying and selling there. They only take 3.5% and paypal I think only takes 3%, as opposed to eBay taking 10%. Sale prices are usually a little less but you net more. The offerings on ebay are getting really really thin. 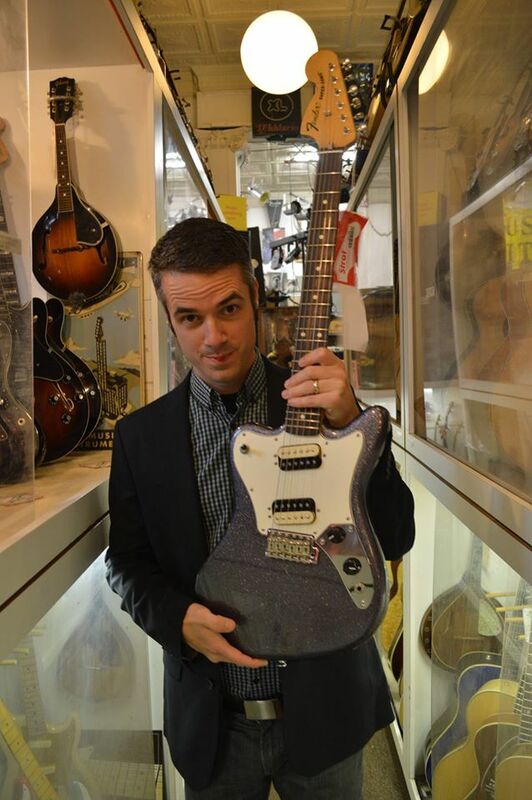 New old stock are still listing on reverb between $719-799 and there is a mint one for $725. I'd say if you are in a hurry do $500. If not hold out for $150-200 more. LOL a Vista Jagmaster just sold for $280 on Reverb last week. There's one up now for $550 that has sat unsold for months. Are Super-Sonics really that much more desirable? I know those recent reissues were selling for like $700+ new... but used?? I've not looked at Reverb before but I think I should check it out regularly. Wish they had prices for the Purple Sparkle one... I rarely see it for sale anywhere in Purple. Purple is prolly worth about $50 more on the used market? And yes, those Reverb price guides really help. i just sold my purple one for 550 usd, but sold it w/ a case included. i think it could've fetched higher, especially if yours is stock, which mine wasn't. gunmetal flake is just too cool and really hard to find right now anywhere. co-sign on reverb being a fantastic place to buy/sell your gear. Might have to sit on it for a longer period of time if the prices keep going up. Not a bad guitar, just not what I am looking for soundwise and wasn't a huge fan of its comfort while standing up. Have my eyes on a Mustang right now.